It felt like I had just hit the pillow when my alarm went off at 6:30. I had a quick breakfast, showered, and went to Kinko's. From there, I headed to the Y and arrived along with Bob (Boardgamegeek ID: NickDanger42) at around 7:30. We spent the next half hour playing game table Blokus to squeeze the most amount of table space into the room as possible, while trying not to make it too crowded. Mark (Mark Smith) and Kevin (futurescaper) were the first to arrive, quickly followed by many more gamers — with fifteen minutes of our advertised start time we had close to 15 gamers (of about 24 that had let me know they would be attending). After some introductions, we got started with some gaming! We reached our apex at around 11:00 when our Kentucky contingent arrived — it was tight for a few minutes, as some two player games wrapped up, but then we had enough tables for everyone (with one small semicircular table to spare). 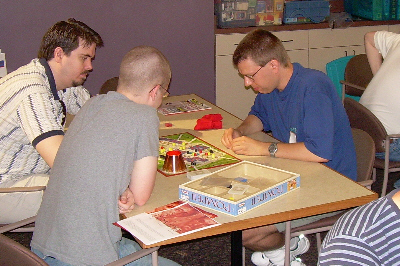 At that time we had six games in progress (La Citta, 6 Nimmt!, Acquire, Nottingham, San Juan, and Revolution (the Revolution game would continue for most of the day)). It was exciting to see the work we put in come to fruition. 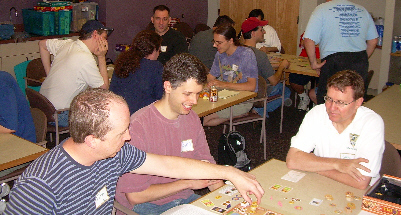 We would get a straggler or two throughout the remainder of the day — all told, 30 different people attended the Game Day (Boardgamegeek ids included: rickkeuler, davidme, futurescaper, gunslinger, jeffjwatts, malachi, Mark Smith, NickDanger42, surlyduff, SybotCB, Verkisto, gregandjan, counterfeit, WoTmanX, and deweller). They came from Tennessee, Mississippi, and Kentucky. I think Steve and his son Carl traveled the farthest from Johnson City, TN — about five hours! 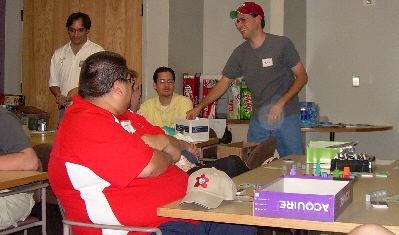 Shortly after 12, I interrupted everyone's gaming to give out the Game Day door prizes — which mainly consisted of Tennessee Game Day 2006 hats. These hats had our symbol (a meeple colored like the TN state flag) and 2006 on the back — they looked great and were generously provided at cost by an internet embroidery company, Let it Sew . Of the 24 people that had donated the requested contribution of five dollars, 18 were awarded door prizes. In addition to the door prizes, the money provided a donation to the YMCA, provided free water and sodas to everyone throughout the day, and the prizes for our Take it Easy Tournament (more on that later). After awarding door prizes, I let people know area eateries for lunch and the gaming continued! Open gaming continued throughout the day and worked pretty smoothly. I don't think anyone had to wait too long for a game to start up and for him or her to get involved. The room was a touch too small for our numbers, resulting in us overwhelming the air conditioning slightly, but it wasn—t too uncomfortable. A good problem to have however, because that means I can start exploring larger venues for Game Day 2007! Finally we awarded Crocodile Pool Party to David Meredith for the worst score (30 pts). I think people had fun with the tournament. Unfortunately the Y closed at 7 pm (next year: longer hours), so, after the tourney, I concentrated on cleaning up the space, while some people got in some last minute games. People said their good-byes and were on their way. A great day — can't wait to organize the next one! Thanks to everyone who came and made it a great day!